Nearly 50 scientists gathered at the University of Notre Dame on Sunday and Monday for the Indiana-Illinois End Epithelial Ovarian Cancer Coalition (IIEEOCC) workshop, an effort to advance collaboration and research on a deadly form of cancer that affects over 20,000 women a year. The workshop, hosted by the Harper Cancer Research Institute, attracted ovarian cancer researchers from nine universities around the Midwest. In poster sessions, presentations, and seminar discussions, researchers discussed topics ranging from new cancer-fighting drugs to the effects of obesity on ovarian cancer development. Stack, who spearheaded the inaugural IIEEOCC workshop in 2012, sees the scientific gathering as an ideal way to understand research as it happens. Rather than waiting for peers to publish their work—a process Stack says can take five or six years—researchers can share up-to-date research methods or experimental results with their fellow ovarian cancer researchers. Underlying the workshop’s atmosphere of camaraderie was a collective focus on the need for more research. Ovarian cancer remains a something of a medical enigma: Researchers are still trying to understand its origin point in the body, a way to detect its emergence earlier, and why it spreads so quickly in environments normally hostile to cancer cells. That lack of understanding makes ovarian cancer particularly deadly. It often goes undetected until it has advanced into late stages. When ovarian cancer does present symptoms, they are often so generic—bloating, loss of appetite, low back pain or indigestion—that afflicted women often dismiss the symptoms as mere digestive problems. 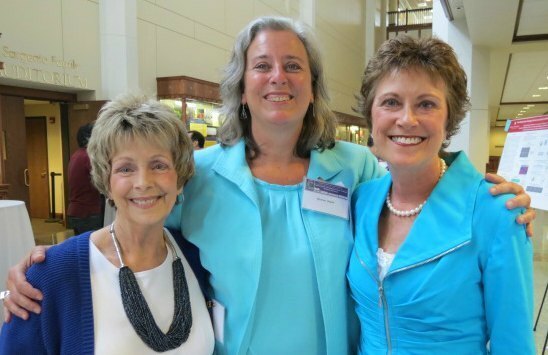 Nancy White and Colleen Olund, both ovarian cancer survivors, talked about the challenges of confronting those symptoms in keynote addresses. White and Olund, who have participated in clinical trials for new treatments, emphasized how research made an impact on their fights against ovarian cancer. White was first diagnosed with stage 3c ovarian cancer, its most severe form, in 1996. Doctors gave her 18 months to live. But after participating in a specialized research trial at Loyola University Chicago—she was the second woman in the United States to do so—White successfully completed treatments and has since remained cancer-free. Olund, a participant in Gyna Girls who has struggled with bouts of ovarian cancer since her initial diagnosis in early 2005, emphasized the need for less debilitating treatments. Dr. Ken Nephew, a professor at the Indiana University School of Medicine who moderated a discussion on Monday afternoon, said he was encouraged by the personal and scientific connections formed at the workshop. Even though the workshop is still in its second year, those collaborations have already borne scientific progress. Nephew and Stack highlighted an article co-authored by attendees of the most recent IIEEOCC workshop, which reviewed different experimental methods in ovarian cancer research. The article was ultimately published in Oncogene, an international scientific journal that will help disseminate the group’s findings to researchers around the world. For White, the workshop was a promising symbol of partnership. Originally published by Michael Rodio at harpercancer.nd.edu on June 18, 2014.